When Stan gets engaged to conductress Susy, it comes as a bit of a blow to his family since, especially now that Olive and Arthur have a baby, they rely on his earnings to keep them going. 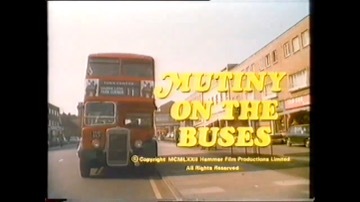 To help boost the family income, Stan makes the mistake of offering to teach Arthur how to drive a bus. Meanwhile, Inspector Blake, determined to improve the efficiency of his layabout workers, makes himself even more unpopular by installing radio receivers in the cabs of the buses. The scene is set for more anarchic, knockabout comedy! The title of the film was chosen in a nationwide competition. With the British film industry in general in deep recession and American funding drying up, Hammer, in desperate need of cash like everyone else, had little choice in a way and reverted more and more to making home-grown comedies based on popular television series. In the long run, though, it was not to be the solution to their ever-worsening crisis.